The project was launched in February 2012with funds from Adsum Foundation as a feasibility study, and in partnership with Andry Lalana Tohana (ALT Mg) who are implementing VVD on the ground. The project aims to use radio as medium to address communications gaps between local communities and the decision makers who shape their local development; also to facilitate the voice of local people and increase open dialogue with a view to improving local governance. The Swiss Embassy, Madagascar and Media Support Partnership (UK) have match funded the feasability study to ensure time to evaluate its impacts and ascertain if it is viable for scaling up. The project design enables local people to learn about and act on their rights to information and freedom of speech and has already produced and broadcast 40 radio programmes in Question and Answer format - in which citizens have recorded their questions and concerns directly to local decision makers and decision makers have recorded their response, edited together as in a dialogue; additionally VVD phone in programmes have opened up debate on may topics from hospital service fees to local security issues - unprecedented media interaction for ordinary citizens in a rural area of Madagascar. Working initially in the Androy Region with 20 radio listening groups, 2 local radio stations, and 19 local service providers (including the local authorties, government agencies, and NGOs) currently a minimum of 10,000 listeners have access to the VVD radio programmes and can participate in phone in programmes. Early results are showing significant positive impacts on the local community and for local decision makers; a full report will be made available shortly. A woman in the Androy Region of Southern Madagascar testifies how her father has listened to a radio broadcast produced by the Village Voices for Development project, and how it has changed her life. This particular radio programme is about land inheritance and speaks also about women's rights. In Antandroy culture, women have very little status and do not traditionally receive inheritance even though Malagasy law gives them this right. After listening to the VVD programme this woman's father decides to give her and her sisters an inheritance of land. In southern Madagascar more than 80% of the population are rural producers reliant on subsistence farming for survival - so access to land is a primary concern. 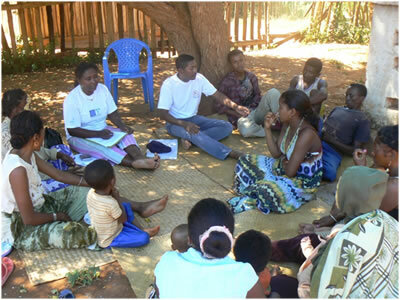 More about the Village Voices for Development (PDF 1Mb).